A good aussie song to listen to with your pet kangaroo . Tönt wie eine Mischung aus INXS und Midnight Oil, und <br>deshalb logischerweise ziemlich gut....<br><br>Knappe 5. 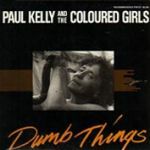 Even though Paul Kelly has been renowned for his songs, he has strangely never been a superstar in his long career, and probably never will be a superstar. But he is in my opinion the poet laurete of Australia, and a lot of people will agree and disagree with me. But Kelly, despite being lauded with praise for his lyrics, still feels like a total beginner in the art of songwriting. <br><br>His songs are timeless and Dumb Things is no different. Very easy to like.